1983/84 season. 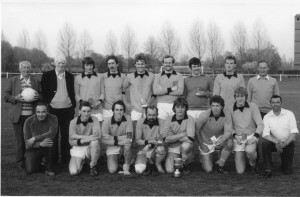 Hemyock Football Club after winning the Seward Cup in Taunton. Front Row- D. Jenkins (Committee) S. Knight, F. Greenhalgh, P. Mathews, A. Moon, G. Sparks, A. Brinsford, G. Salter.